3 Musketeer Mississippi Mud Cake will make your head explode. It’s chocolate heaven for the chocoholics. What better dessert for my #chocolatefriendsofTenaciousM? 2. Line a 15x10x1 inch sheet pan with foil or parchment paper. Spray with non-stick spray. 3. Microwave 1 cup butter and chocolate in a microwave-safe bowl at 30 second intervals until melted. Stir to combine and allow to cool. 4. Combine sugar, flour, cocoa and salt. 5. Combine eggs and vanilla with cooled chocolate. 6. Add egg mixture to flour mixture and mix until combined and smooth. 7. Pour onto prepared sheet pan. 8. Bake at 350 degrees for 20 minutes. 9. 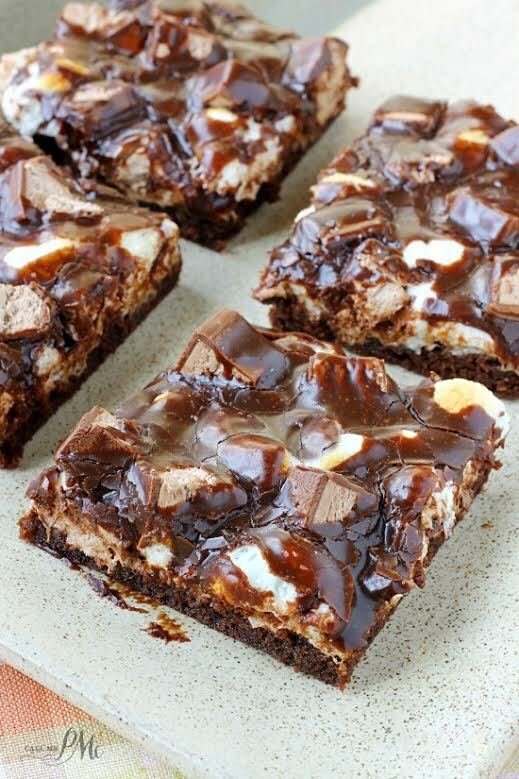 Carefully remove from oven and spread marshmallows evenly over brownie layer. 10. Return to oven and bake 8 to 10 minutes to toast marshmallows. 11. Remove from oven and immediately sprinkle with 3 Musketeer candy bars. 12. Make Chocolate Frosting: Combine butter, cocoa and milk in a small sauce pan over low heat. Cook 2 to 3 minutes until butter is melted and mixture thickens slightly. 13. Add confectioner’s sugar one cup at a time, whisking to combine. 14. Add vanilla and whisk until smooth. 15. Pour over slightly cooled cake. Thank you! Let me know if you try it.